I was not human banana at least today. The trip was originally for inshore bluefin tuna trip. But I tried to contact Capt John of the Hooked Up II out of Cape May to switch to overnight trip to Washington Canyon as bluefin fishing was hit and miss while yellowfin/bigeye fishing were red hot in Washington Canyon. However, I couldn’t contact Capt John because he was in Washington Canyon for an overnight trip. My friend who fished out of Cape May yesterday told bluefin fishing was very slow. So I didn’t have much expectation of the trip. When we arrived at the destination, there were many boats there already. Capt John started to troll and I setup my jigging rod (Black Hole Magic Eye 571XXH/JM PE filled 40 lb braid and 200g Super Sardine jig). The Magic Eye is a fluke rod, but I wanted to test the strength of the rod with small tuna. 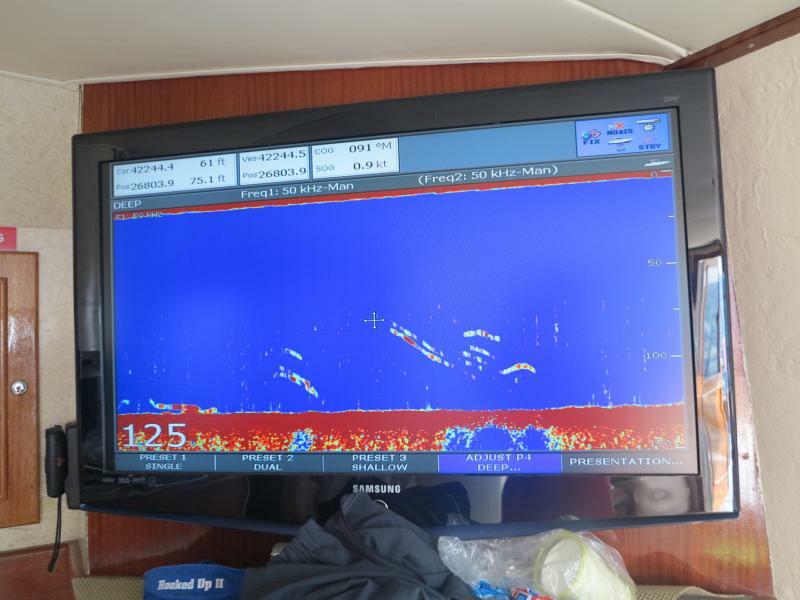 To my surprise, we marked tuna near the bottom on the screen within 10 minutes after trolling. So we gave up trolling and it became a jigging trip. We didn’t fish long, but we had 9 – 10 hookups on jigs and I had 6 hookups on 200g Super Sardine jig until we leave at 11:00 am. It’s been a long time since I had good tuna jigging. It was extremely fun to fight 50 – 70 lb bluefin with such a ultra light rod and small reel. I always had good tuna jigging whenever I fished with Capt John of the Hooked Up II and we were not disappointed on this trip either. Capt John is one of very few charter boat Capt in NJ who have good understanding of tuna jigging and knows how to set up for jigging. I observed most trolling boats around us didn’t have any action at all. It is good to see bluefin are coming back after a few years’ absence. Huge bodies of bluefin are spreaded from Hot Dog to AP areas now. I can wait to go back again with jigs.